The Hurricanes improved to 4-0 in November, and earned the important 2 points with the 3-2 win over the Blue Jackets. Elias Lindholm came through in the clutch and got the win for the ‘Canes at the last possible moment in overtime. Thus the “Swedish Beast” was born. He was named the 1st star for the night, and got the team fire hat, as well. While goals were absent from the 19-year old Swede’s play in October, Elias Lindholm has found his game so far in November. Starting with two goals against the Arizona Coyotes on November 1st, one goal and one assist on November 2nd versus the reigning Stanley Cup Champion Los Angeles Kings, an assist on November 4th in Columbus, and a game-winning goal last night, Lindholm has notched six of his seven points on the season in November’s first four Hurricanes games. The team has gone from two points to ten in the 4-game span, and Elias Lindholm’s rediscovery of his scoring prowess has contributed to the turnaround in a huge way. Did I say “the 19-year old?” Yep, he is only 19. 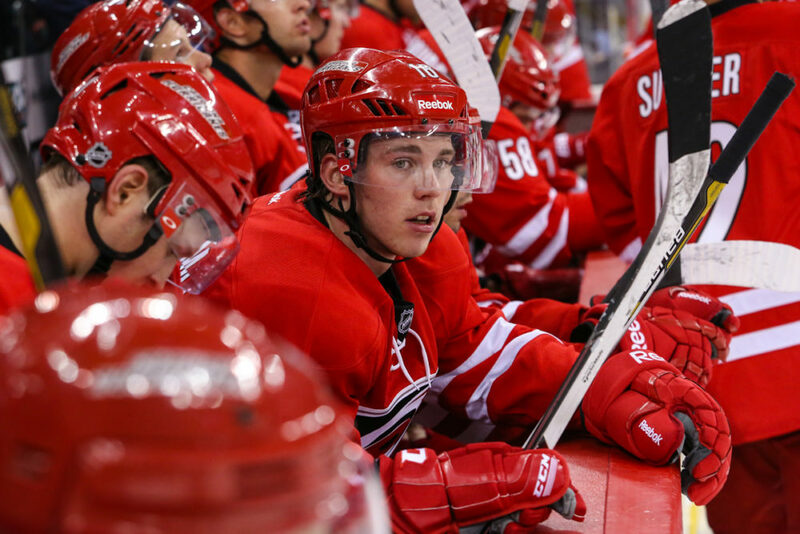 If you are like me, that puts you in mind of another young Carolina Hurricane that swept the NHL by storm – Jeff Skinner. While still young by league standards – Skinner is 22 – “Skins” is viewed by most as a veteran on this team. Lindholm has a great example in the locker room and on the ice in Skinner, who has proven that age need not be a hindrance to success in the NHL. Skinner has struggled a bit this season. Coach Bill Peters has taken “Skins” off the top line and moved him to the fourth line. Not unlike the 2-game healthy scratch of Alexander Semin, Peters is not shy about moving guys to get their attention. Skinner was shuffled around into other lines last night, and got the ‘Canes on the scoreboard first against the Blue Jackets. Jeff Skinner has two goals and one assist this season. But something tells me that Peters has gotten his attention and that ‘Canes fans might just see “Skins” tally begin to go up quickly from here. Victor Rask has been nothing short of amazing for the Carolina Hurricanes. Not just during their recent November success, but all season thus far. While Coach Peters acknowledged the absence of Jordan Staal, everyone knows that Victor Rask has exceeded all expectations to this point. He and Riley Nash have played with great intensity and consistency every game this season, and last night, Rask was rewarded with his second career NHL goal to tie the game with the Blue Jackets. You might ask, “Mark, are you going on about a guy with two goals?” Yes, I am. Victor Rask has been a dominant force for Carolina in the face off circle, is getting a lot of time on the ice, and is bringing stability to the center position that is critically needed while Jordan Staal is out. Again, he and Riley Nash are doing the work needed night in and night out. There is no question that without these two playing as they have, November might have been a continuation of October for the Hurricanes. Another night, another Cam Ward display of goal tending excellence. These nights were few and far between in October. Actually few and far between the past few years. But Cam Ward is currently in the “zone” and has saved wins for this time with his third period play in November. Lights out in the third versus the Kings, last night Ward turned it on again when the Blue Jackets were throwing it at him from everywhere. He made several saves to preserve the tie score and keep the ‘Canes in the game in overtime, allowing Elias Lindholm a chance to net the game-winner. After five straight starts, “Wardo” will get a breather tonight. Coach Peters announced last night that Anton Khudobin will be starting in-goal Saturday night as the Hurricanes square off against the Washington Capitals. This might go against the notion of “staying with the hot hand,” but Khudobin needs to get in and have the opportunity to play. He is not a slouch – Ward and he both had tough outings in October. We will see if Khudobin can also get in the “zone” against Washington, giving Coach Peters two goalies he can turn to with confidence. Not a bad problem to have if it works. The Caps are 5-5-3 with 13 points. The Hurricanes are 4-6-2 with 10 points. Saturday night’s contest is key for the ‘Canes against another Metropolitan Division rival. A win will pull them within 1 point of Washington. October may soon fade into the cloud of distant memories if Carolina can stay focused and keep winning. Saturday night can be another step in that direction.